Sirmione has long been one of the most popular resorts on Lake Garda and the number of hotels available in the town bears witness to that. It is perhaps the most accessible to the majority of Italians, being close to an important motorway junction which allows easy access from all directions of the compass. But equally important is the look and feel of the town. Most visitors to the resort, including the thousands daily from other towns on the lake, want to visit the Old Town on the peninsula, with its narrow streets and alleys leading up to the gardens and rocks at the end of the peninsula. Of course, that kind of popularity is not necessarily the kind of thing that holidaymakers staying in the town are looking for and there are plenty of lagoon-side hotels clustered along the road on the southern part of the peninsula leading towards the old town from Colombare. 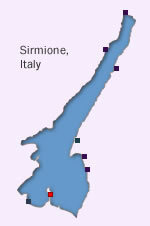 Looking for some of the best-rated accommodation in Sirmione?